This image is a Mini-RF synthetic aperture radar (SAR) strip overlain on an Earth-based, Arecibo Observatory radar telescope image. 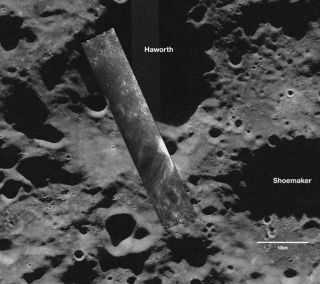 Taken Nov. 17, 2008, the south-polar SAR strip shows a part of the moon never seen before: a portion of Haworth crater that is permanently shadowed from Earth and the sun. Using aNASA radar flying aboard India's Chandrayaan-1 spacecraft, scientists aregetting their first look inside the moon's coldest, darkest craters, where somesuspect ice may be hiding. The Mini-SARinstrument, a lightweight, synthetic aperture radar, has passed its initialin-flight tests and sent back its first data. The images show the floors ofpermanently-shadowed polar craters on the moon that aren't visible from Earth. Scientistsare using the instrument to map and search the insides of the craters for water ice. "Theonly way to explore such areas is to use an orbital imaging radar such asMini-SAR," said Benjamin Bussey, deputy principal investigator forMini-SAR, from the Johns Hopkins University Applied Physics Laboratory in Laurel, Md. "This is an exciting first step for the team which has worked diligentlyfor more than three years to get to this point." The images,taken on Nov. 17, 2008, cover part of the Haworth crater at the moon's southpole and the western rim of Seares crater, an impact feature near the northpole. Bright areas in each image represent either surface roughness or slopespointing toward the spacecraft. Furtherdata collection by Mini-SAR and analysis will help scientists to determine ifburied ice deposits exist in the permanently shadowed craters near the moon'spoles. "Duringthe next few months we expect to have a fully calibrated and operationalinstrument collecting valuable science data at the moon," said JasonCrusan, program executive for the Mini-RF Program for NASA's Space OperationsMission Directorate in Washington. Mini-SAR isoneof 11 instruments on the Indian Space Research Organization's Chandrayaan-1and one of two NASA-sponsored contributions to its international payload. Theother is the Moon Mineralogy Mapper, a state-of-the-art imaging spectrometerthat willvprovide the first map of the entire lunar surface at high spatial andspectral resolution. Chandrayaan-1launched from India's Satish Dhawan Space Center on Oct. 21 and began orbitingthe moon Nov. 8.